South Western Railway and Network Rail should review the way they manage, report, analyse and forecast punctuality, according to a new report into performance. The recommendation is one of 28 from a performance review conducted by veteran railwayman Sir Michael Holden. Transport Secretary Chris Grayling appointed Holden to lead a review SWR had commissioned from Atkins, as the new operator inherited years of poor performance when it took over from South West Trains in August 2017. Holden’s 28 recommendations include a call to NR to cut the number of temporary and emergency speed restrictions on the lines into Waterloo, which is Britain busiest station. 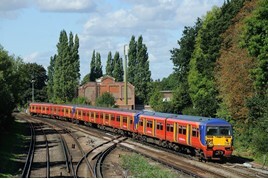 Holden found that years of management turbulence had led to declining performance, coupled with a timetable that had become less resilient in the face of more passengers, a shortage of fully trained drivers, the shift of control staff from Waterloo to Basingstoke, and longer trains that took more time to clear junctions, points and platforms. SWR (and SWT before it) struggled to recover delays for several reasons, explains Holden’s report. He found that the train operators had lost their capability to control train crew during disruption, and that there was inadequate knowledge of diversionary routes. For the FULL story, including all 28 recommendations, read RAIL 862, out now.